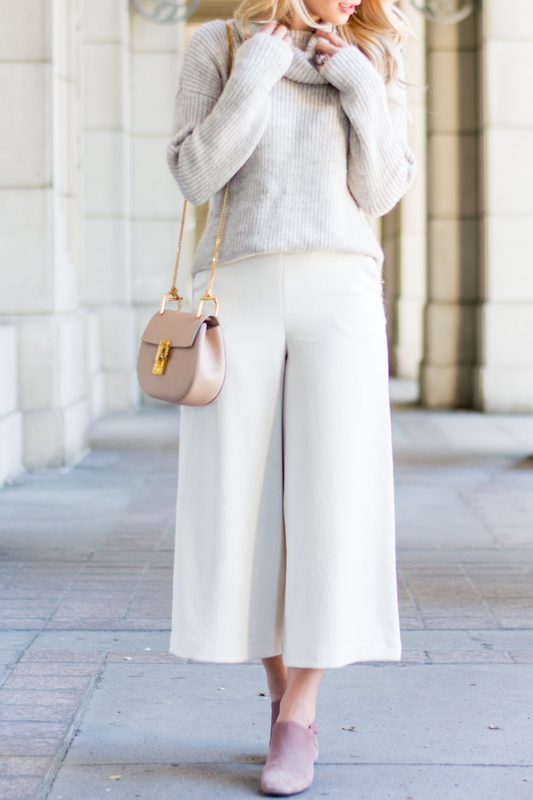 OOTD - White Culottes For Fall | La Petite Noob | A Toronto-Based Fashion and Lifestyle Blog. You are making me want to try to wear culottes again, but I have a feeling I look ridiculous in them. Love them on you though. Also, need that cozy sweater to keep warm during photoshoots now. I had forgotten how it is to shoot in winter. eek. Oh man, I really need to get on that culotte train, even though I'm convinced they won't look half as good on me as they do on everyone else. What a gorgeous, cozy look for fall too! I love this looks - it totally works. Pretty bag too! One of my favorite pieces ever, culottes! and you look so perfect on them!